Very new to the scrapping world and wondered if one should try and specialize right away, or stick with "general" scrapping for the first couple years in order to get a broad knowledge base? From reading numerous posts, different cities, different places, different countries all have a uniqueness to them. My mind tells me to stay broad at first, and then narrow it down to a niche, but then it also says that if one stays "general' then there is more potential to not get into a niche which bottoms out. Opinions, advice, comments would be welcome. Market conditions change all the time. If you are running a business, it's a very good idea to keep in contact with multiple buyers, and try to go after the stuff that can get the most $ per hour of labor ( after expenses ). Also a good idea to educate yourself on electronics collectibles ( IE: many old slot cards from before 1990, vintage electronics testers, e.t.c. ), rare/desirable components ( example: white ceramic ICs ), precious metals, exotic metals ( tantalum, ruthenium, indium, germanium, e.t.c. ) , and parts that sell well (vintage knobs, metal gears, working vacuum tubes, e.t.c. ) . Diversity creates opportunity and reduces boredom. Although I move a lot of metal and do some demolition, recycling is the over all objective. Scrap metal art, cleaning out shelter belts, refurbishing old machinery, and reclaiming barn wood round out my endeavors. My business motto is to give back more to the earth than I take out. Other members on here sell antiques, resell items from garage sells, build computers, etc. As you pointed out, a persons location and product availability will eventually lead you to specialization. Until then, experiment and have fun. To mikeinreco - nice web site. 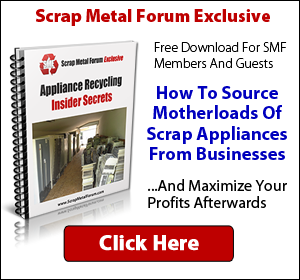 Are you scrapping as a hobby of just a for minor extra income? Then just do whatever you find most appealing and have fun. Full time? Part time? All have different answers but really find out what you can source. Maybe some things are off the table already and you *have* to specialize. Either way it doesn't hurt to learn a little more info than you regularly use. Currently it's hobby with the intent of getting to the stage of an income supplement later on. My space is limited, so big bulky ferrous stuff isn't in the cards right now, but dense heavy stuff is. Working full time makes time an issue. My plan is to learn, do "general" scrapping within my limits, develop a good relationship with the various yards all with the intention of eventually moving it into a side business as an income supplement either just prior to, or when I retire. I may never see maximum dollar return, but as long as I get some money flow then I think it will be fine. Now that being said, if by some fluke chance it does better than I expect, then I'll look at things a little closer and see what the outcome might bring. Going slowly I think will be beneficial because it gives me time to learn and also determine the extent to which I'm willing to take things as I move towards my golden years. Looking at your website helped a lot. I like how you've worded things and appeal to the 'green' in people. I figure on a "junk" removal service in my later years because I think the millennials will be chucking everything from the generations past and going the "disposable" route. The education part is what I consider the biggest component. If you don't know what to recycle, or how to get decent pricing for that which you want to recycle, then you may end up in the hole for all you time and effort. It all depends on your markets and your storage ability. Ferrous scrap is far less valuable, requires far more space, but is also far less volatile versus nonferrous. So while nonferrous may be riskier (copper can gain or lose 10-20 cents in a week, especially in the geopolitical environment we find ourselves in today), if you're smart and thoughtful, and lucky, the reward can be significant. I think the best thing you can do is to cultivate relationships with your local scrap yards, figure out market movements and indications from them whenever you can, and just buy whatever you can at the best price you can. Perhaps most importantly, don't be afraid to hold onto material for better pricing in a week or two when market winds shift. If you can find a good buyer at a good scrap yard, you should be able to get all the information and help you need to make the most money you can. Speaking from a personal perspective, although I work for a large multinational scrap company, I always try and make sure the scrappers I buy from understand the markets as much as possible so they can make as much money as possible...I'll even tell them sometimes to hold onto that copper for a week if I think prices are about to go up. It doesn't benefit me to screw anyone over; you should look for buyers/companies who want to help you, not to screw you over for a couple extra cents of margin. Last edited by mleach; 02-26-2019 at 10:34 AM. If you start out in the scrap business already specialized in something than you probably don't even need to bother asking this. I think the majority of us here just take what ever we can get. some seem to find a way to get more or less of what they want or don't want but the majority of the time your just taking what you can get. with that being said you will find yourself leaning in a certain direction and building a so called style. but always be open to change. no matter how hard I try to specialize in something the scrap world always has me doing random stuff with everything. With that being said I do seem to haul more steel like cars and household appliances than anything but I'm always finding myself in different situations. I'm sure that is true for 90% of the people on here. unless of course your just sitting in a shop buying computers at auction to strip apart. but even that i'm sure has its specialties. IF you are limited on space and time that just means you have to make things flatter and learn how to stack better. I was scrapping the entire time I was on Ft. Hood. Id have like 6 washers and dryers broken apart and flattened out sitting in my F250 out in the parking lot until I could go to the yard on Saturday. I had no where to put anything except in my truck. I eventually got two trucks and two trailers and people would just throw stuff in as they drove by. still It had to stay in the truck in the parking lot. I see people living in the downtown areas by me in similar space constraints. they usually are the ones with the scrap cages and old beater long beds. Do you specialize in just one type of scrap?